I am truly heart sick about it. Had another icon like the Eiffel Tower been destroyed, It would have been easy to rebuild. I don't expect to see Note Dame restored in my lifetime. 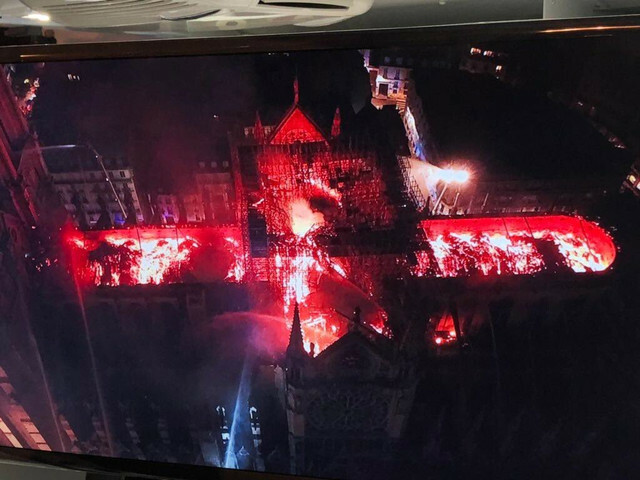 It looks to be in far worse shape than the George's Chapel was. There's not a whole lot left of the main part of the Nave, it would appear. 856 years it stood without issues. I hope it wasn't arson. I hope the insurance covers it. How many renovations has it had in that long history? It isn't like they produced better Christians for all the expensive upgrades. No army has ever used it as a fort or a sanctuary for the 'Royals' when the surfs were intent on burning the country down?? If true that would explain why they have the reputation they have. Last edited by MHz; 1 week ago at 10:27 AM..
Do you ever make sense? Damn...the thought of all that plastic drowning...Oh! the angst!!! The angst!!! I knews we was all doomed when the mammoths and the saber toothed tigers all went extinct. Everything that was born dies. That was all trump's fault too. Millions of dollars have already been pledged for restoration, spam but they will never be able to replace the priceless timbers that formed the roof. Some of those timbers were said to be 1,300 years old, having been already 300- 400 years old at the time they were felled between 1160 and 1170. Thankfully, it appears that the famous and unbelievably beautiful stained glass windows survived. Also much of the art work that was not removed also survived. I wonder about what all that water might have done - along with the fire itself - to the structural integrity of the building. That a boy Cliffy, wallow in grief and misery! I doubt it Pete. The average arsonist couldn't be bothered with the long climb up. The bell ringer did it! So much for churches being there for the poor. They seem to have fuked up on installing water sprinklers when they have billions worth of art alone. If the place was in such fine shape what did the renovations include if fire-proofing was not part of the goals?? Will steel replace the wood and it should be good until an airplane falls on it. Compared to your source of delusions he is not any worse off than any other deluded person. You both need to figure out who God is and quit relying on liars to feed you the truth. Learning how to fly a plane is a lot more work . Steel is going to have to replace wood or they're going to denude that last few precious stands of European oak to re-build it. Why not a steel structure above the Gothic vaulting? It will be a relevant part of the long history of the building. Where was the asbestos cladding over all that precious wood?? They have enough pics that the steel replacement would look like the original timber, right down to the dust. Do they know dust is a fire hazard when found in enclosed spaces and it is microns in size? I was walking through very large forests in Europe last Spring, they’ve got plenty of trees to make enough timbers for the roof. What they don’t have is big, old growth trees so they will have to use laminated beams for the roof. Laminated beams are much stronger than non-laminated. That didn't make sense either. Good, I prefer you remain clueless. The coronation of Napoleon as Emperor of the French took place on Sunday December 2, 1804 at Notre Dame Cathedral in Paris, a Revolution and 2 world wars.. While French firefighters were putting out the destructive blaze at the Notre Dame Cathedral, another holistic site was also up in flames. Jerusalem's Al-Aqsa Mosque, which is among the holiest sites in Islam and was built almost 1,800 years ago, was struck by blaze while the monumental Catholic Church was also devastated with fire. The fire is said to have started in the Al-Marwani Prayer Hall - also known as Solomon's Stables - part of the same compound as Al-Aqsa mosque and the Dome of the Rock. Fortunately, firemen of the Islamic Waqf department of the city were able to control the fire before any harm was done to the individuals or the other prayer halls. While the cause remains unknown, sources claim that the fire could have been ignited accidentally by children who were near the prayer hall at the time. Sounds like that Kiddish lighnin' may have struck again. Last edited by Danbones; 5 days ago at 03:58 PM..
Steel doesn't burn ... or at least, not in that temperature range. On the lighter side of the news - President You-Know-Who tweeted (seriously)that France might want to use water bombers to put out the fire. Of course, officials just don't want to say Muslims started the fire.. if they did Natzweiler-Struthof would be firing up the ovens, not for Jews this time..